1. Firmly hold the nib with the tweezers and remove it. 2. 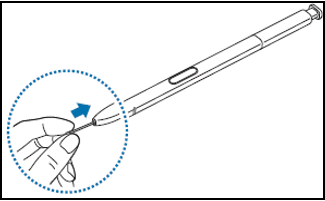 Insert a new nib into the S Pen. or the nib may be deformed. • Do not hard press on the screen with the S Pen. The pen nib may be deformed. • If you use the S Pen at sharp angles on the screen, the device may not recognize the S Pen actions. 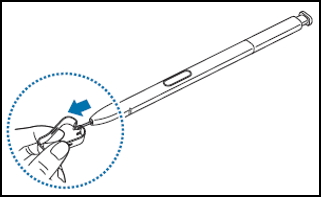 • If water enters the S Pen slot, gently shake the device to remove the water from the slot before using it. • For more information about the S Pen, visit the Samsung website. • If the S Pen is not working properly, take it to a Samsung Service Centre. Galaxy Note8: How do I translate words or sentences?